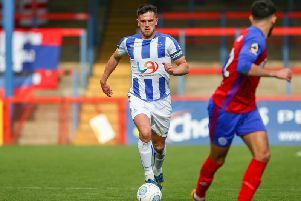 Former striker Connor Simpson is backing Hartlepool United to bounce back from their recent on and off field struggles. The 18-year-old was sold to Preston North End in January for a fee of £50,000, paid up front by the Championship outfit to aid Pools’ fight to stay alive. And just this week the youngster was handed his first-team debut by manager Alex Neil, coming on for the final minute of the Lilywhites’ 1-1 Championship draw at Villa Park against high-flying Aston Villa. Speaking to the Lancashire Post, Simpson said he is sure Pools will turn things around in the not too distant future. “It is a shame what is going on at Hartlepool because it is such a good club,” he said. The tall frontman says it was a dream come true to make his second tier debut less than six weeks after heading to the North West. In fact, he says it was the proudest moment of his life when he got the unexpected nod. “I was probably only on the pitch for a minute or two but to make my debut for Preston at Villa Park was the proudest moment of my life so far,” said the teenager. “That is probably the best ground in the division with a lot of history and tradition, so to play there – however briefly – was really good. Getting the chance to pit his wits against a childhood hero, Simpson had to pinch himself. He continued: “When I got on the pitch and went up front, I was near to John Terry who was in the centre of Aston Villa’s defence. “That was surreal as I grew up watching him on TV playing and there I was on the same pitch as him.